Samples of dipyrromethene-BF2 dye PM597 incorporated in copolymers of 3-(trimethoxysilyl)propyl methacrylate (TMSPMA) with methyl methacrylate (MMA) and 2-hydroxyethylmethacrylate (HEMA), and in terpolymers of MMA, HEMA and TMSPMA are characterized. The absorption cross-section spectra, stimulated emission cross-section spectra, and the excited-state absorption cross-section at 527 nm are determined. The fluorescence quantum distributions and fluorescence lifetimes are measured. 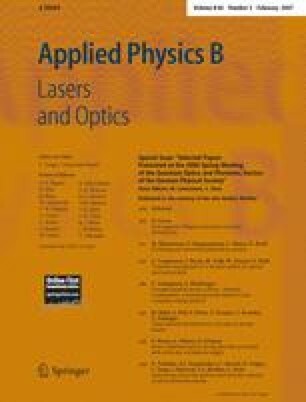 The photo-degradation is studied under cw laser excitation conditions and quantum yields of photo-degradation are extracted. PM597 solid state samples are compared with PM597 in liquid ethyl acetate solution. The fluorescence quantum yield of PM597 is higher in doped samples (around 70%) compared to PM597 in ethyl acetate (43%). The excited-state absorption cross-section was found to be negligibly small. The photo-stability is considerably larger in the polymeric samples compared to the liquid solutions.